What do we know about Faslane, the home of Trident nuclear weapons? 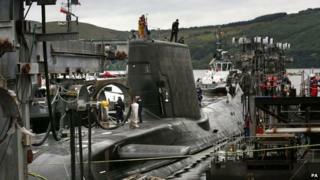 Chancellor George Osborne has announced £500m of investment in the Faslane naval base on the Clyde. So, what do we know about the base, and why is it so important? Her Majesty's Naval Base Clyde - commonly known as Faslane - is one of the Royal Navy's three main operating bases, alongside HMNB Devonport and HMNB Portsmouth. Faslane is best known as the main base for the Royal Navy's Submarine Service, including the UK's four Vanguard-class nuclear-armed submarines which carry Trident II D-5 ballistic missiles, and the latest generation of Astute-class attack submarines. At least one Vanguard submarine is always on patrol to provide a continuous at-sea nuclear deterrent. Each of the vessels carries two locked safes - an outer and an inner. The inner safe contains a handwritten Letter of Last Resort from the prime minister, which provides orders on what action to take should the submarines's commander believe that an enemy nuclear attack has destroyed the UK government. Faslane was chosen to host the UK's Polaris nuclear-armed submarine fleet at the height of the Cold War in the 1960s because of its relatively secluded position next to the deep waters of the Gare Loch and Firth of Clyde on the west coast of Scotland. Anti-nuclear campaigners have held regular protests outside the base ever since. About 3,000 service personnel are currently based at Faslane along with 800 family members and approximately 4,000 civilian workers, most of whom are employed by Babcock Marine. Earlier this year, Able Seaman William McNeilly, a submariner serving on the Vanguard fleet, wrote a report detailing allegations of serious security and safety breaches at Faslane. A subsequent investigation by the MoD said his allegations were either incorrect or the result of misunderstanding. The Faslane base is eight miles from the Royal Naval Armaments Depot at Coulport, which is responsible for the storage, processing, maintenance and issue of the Trident warheads and other submarine-deployed weapons. Together, the Faslane and Coulport facilities form a major part of the economy of Argyll and Bute and West Dunbartonshire. The future of the base became a key battleground ahead of last year's Scottish independence referendum. The Scottish government, which supports independence and opposes nuclear weapons, pledged to banish Trident from Faslane and instead turn the facility into a conventional naval base which would continue to employ the same number of people as is currently the case. The UK government pledged that Faslane would become home to all Royal Navy submarines if Scotland remained a part of the UK, with the number of staff at the base increasing to 8,200 by 2022. This would include the submarines which would need to be built to carry the new generation of nuclear weapons which would replace the current Trident nuclear system. The four current Trident-armed Vanguard submarines are due to retire by 2028, although the missiles they carry will have their operational lives extended to 2042. Work has already started on designing a replacement system, which would enter service between 2028 and 2035, but a final decision has yet to be taken. The UK Parliament voted in 2007 to "maintain the strategic nuclear deterrent beyond the life of the existing system." But the government decided in the Strategic Defence and Security Review of 2010 to delay the final decision on the successor to Trident until 2016. The Conservatives want a like-for-like replacement for Trident, which would see four new submarines built. Labour also said before May's general election that it favoured a four-boat solution, although Jeremy Corbyn, who is seen as being the favourite to win the party's leadership contest, has vowed to scrap the UK's nuclear deterrent. The Liberal Democrats believe the UK should have fewer than four nuclear-armed submarines and has proposed ending the current system of carrying out constant patrols. The SNP - which forms the devolved Scottish government in Edinburgh - remains committed to completely removing nuclear weapons from Scotland. The Ministry of Defence has estimated the replacement programme will cost up to £23.4bn at 2013-14 prices. But the Campaign for Nuclear Disarmament (CND) has put the full cost of the Trident replacement at £100bn over its 40 year lifespan.